Cover the potatoes, whole and unpeeled, with cold water in a pan, add salt, bring to the boil and simmer for 20-25 minutes until tender. Drain and leave to cool slightly. Meanwhile, peel, core and slice the apples. Put into a pan with 2-3 tbsp water and cook gently for 15-20 minutes until completely soft. Purée in a food processor. 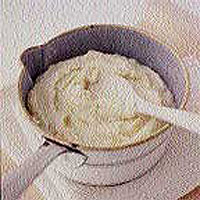 Drain, peel and mash the potatoes, or pass through a potato ricer back into the pan. Add the butter and milk, and beat until smooth (you may want more or less milk, depending on the texture you prefer). Stir in the hot apple purée and serve.